In late 2017, periscopeUP was contracted to help a regional entertainment booking site reach a larger audience and improve user functionality for better engagement and improved conversion rates. The online entertainment booking site is dominated by several well-established aggregator sites and it is challenging for newer and niche sites to rank organically at the top of the search results for competitive keyword terms. In addition, our client faced a larger obstacle – its website was coded in a manner that prevented it from being crawled by search engines. At the start of the engagement, the website was not even ranking for its branded terms. We developed a new website in WordPress, optimized it according to SEO best practices and added plugins for security, backup and custom client needs. WordPress is preferred by many webmasters for its easily customizable design and functionality, straightforward approach for content additions and text changes, and its compatibility with SEO techniques to facilitate search engine rankings. In addition to regularly updating WordPress and its plugins, we monitored the site from a technical perspective, freeing the client to develop additional content for the site. We added the ability to browse musician bios and search by type of event, instrument, ensemble or musical genre. In just six months, the site went from ranking for no terms nationally on pages 1 and 2 to ranking for 23 terms. 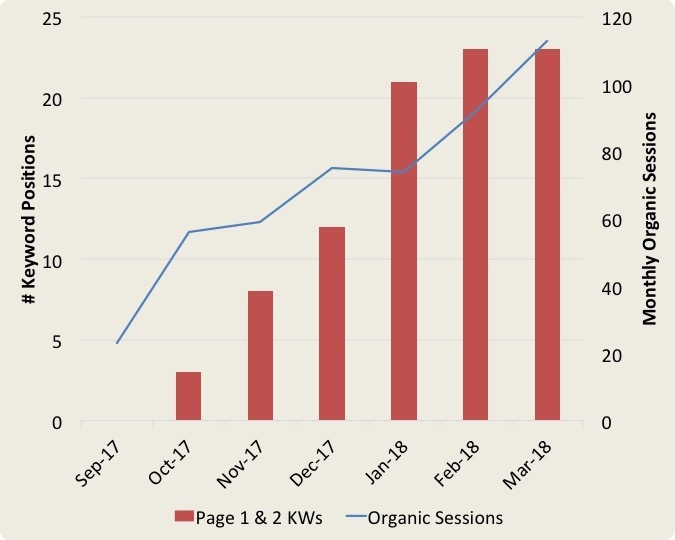 During this same timeframe, organic sessions grew by ~391%. The positive results shown in the graph to the right illustrate how WordPress maintenance services translate into gains in rankings and organic sessions. In addition, a well-maintained WordPress site increases the efficiency of content generation and leaves a website owner with more time to focus on business growth.